500,000+ 5 Star reviews. On all orders to the UK Mainland. Top brands at low prices. Range of tools including top brands. Macdee Toilet Frame + Dual Flush Pneumatic Cistern. Makita DHP453SFTK 18v Lithium Combi Hammer Drill + 101 Piece Screwdriver Bit Set. CPL63CP Macdee NEW KAYLA DUAL FLUSH CPL61CP Pneu Compact II Concealed WC Pneumatic Toilet Cistern 6 Litre 2 Maximum Installation Flexibility Macdee are proud to introduce the new Kayla water saving flush valve, a brand new, air operated flushing valve. Wasily adapted to suit individual requirements, Kayla is designed to deliver a reliable flush every time. As well as a choise of side of bottom inlet (This model is a side inlet), the Kayla valve has an adjustable overflow, three dual flush options and will work in almost any concealed cistern. More importantly perhaps, with the long flexible hose, you have greater freedon to position the flush button further away from the cistern, making installation ultimately flexible. New 2 Dual Flush Outlet Valve - DVA0500 Valve.. New 2 Dual Flush Outlet Valve - DVA0500 Valve Details Extra Long flexible pneumatic hoses allow push buttons to be located further away from the cistern The overflow can be adjusted to suit most cisterns, making the kayla valve perfect for retro-fitting Macdee's distinctive grey adjustable float and top make it easy to identify the Macdee Kayla in any project. A removable valve body means the valve mechanism can easily be replaced without having to remove the cistern. Dual-flush volumes can be adjusted to give flushes of 6/3 litre, 5/3 litre of 4/2 6litre to optimise flush water used. Standard 2 (bore) outlet connection How does the Kayla Cistern Work? Most flush valves work using mechanical connection, such as rod of cable, between the push button and the valve mechanism. The new Kayla valve is pneumatically operated through flexible plastic hoses instead; when the flush button is pressed the increased air pressure in the hose activates the valve and flushes the WC. The new Low WC & bidet frame, manufactured from high quality materials, offers a universal solution compatible with most pan and bidet installations. It is quick to assemble and can be fitted in furniture 400 mm wide! Features UNIVERSAL: All in one low frame for wall hung WC pans & bidets, Wall and floor mounting. ADJUSTABLE: Adjustable feet, Wall fixing from 170 up to 325 mm, can be set sidelong. Adjustable in height (pan from 350 to 510mm), at the point of installation. Thanks to its small width and depth, it can be fitted in furniture 400 mm wide. Whats included: - Floor mounted and wall mounted versions - Pan AND bidet fixing system - Scews//bolts (floor and/or wall fixings, threaded screws for either concrete or wood joisted floors) - Instructions Dimensions Height: 320mm Width: 336mm Depth: 140mm. Our carriers apply a surcharge to certain UK Islands, Northern Ireland and the Scottish Islands, unfortunately we have to pass this charge on to our customers. Whilst we do not want to pass on surcharges to our customers we are unable to absorb the full cost of sending to these orders. The only exception to this are items that are delivered on a palletised service which will have to be booked in with a member of our Buyaparcel team. Any parcel being delivered by courier will require a signature on arrival. If you are not at home the driver will leave an information card. You can track the progress of your parcel by the Track My Order link at the top of the page. If your goods have been sent by a trackable service you will be able to track your order stage by stage using the couriers online tracking system. Buyaparcel UK Deliveries - Couriers. If the date and time is not convenient, you can simply either text back or reply back via the website to choose the next convenient date, leave in a safe place or leave with a neighbour. Please check the UKMAIL site for your closet depot. Details of these zones are below. Zone 2 The Highlands and Islands of Scotland postcodes IV, HS, KA27-28, KW, PA20-49, PA60-78, PH17-26, PH30-44, PH49-50, ZE. Zone 3 Northern Ireland, Isle of Man and Isles of Scilly -postcodes BT, IM, TR21-25. Please note - items over 1.4m are manually handled through sortation, this can cause the item to take up to 48hrs to be delivered. If you goods are being delivered on a pallet, you will need to sign for this. Our team work extremely hard to get your parcels to your door is the shortest possible time but please note that we recommend you do not book a plumber etc until you have received and checked your goods. Credit / Debit card - We accept all major credit and debit cards. The order must be sent to the same address as the billing address. Please call 01502 473025 for further information. Once you inform a member our team, you can then return the parcel within 30 days of receiving the goods. This is under the following conditions. Carriage charges for returning unwanted parcels or items ordered in error are at your expense, we cannot be held responsible for this. Please use a traceable service, otherwise there is a possibility the courier could misdeliver your goods and your parcel will not be relocated. We cannot be responsible for which courier you choose to return any items back with. It is highly important that you check your goods as soon as they are received. Damaged items delivered with Palletways must be noted when you sign for it and reported to us within 24 hours. It must be signed as either damaged or unchecked for the claim to hold. Return costs will only be covered if authorised by a member of the Buyaparcel team. We cannot be held responsible for an arranged collection that fails. If this occurs, you will need to return the parcel of your own accord, no matter the reason for the original collection. Faulty Goods: If your item arrives faulty, you must report it to us within 24 hours. Emailing us that you wish to cancel your order does NOT guarantee its cancellation. Only once the order has been confirmed as cancelled by a member of our team is this the case. Once an order is in the despatching process, we are then unable to cancel it. We do not take financial responsibility for the cost of the return of any products ordered in error or that are no longer wanted. If this is the case you will be contacted by the carrier advising how to arrange redelivery. Your statutory rights will not be affected. We cannot be held responsible for any costs incurred whilst you are in communication with our team. Macdee White High Level Heavy Duty Toilet Cistern + Left / Right Pull Chain Cord. Grohe 37762 Adagio Concealed Pneumatic 6 Litre Toilet Cistern + Chrome Button. Grohe 38528 Rapid SL 3 in 1 WC Set 1.13m Concealed Frame Cistern Plate 38860. Angled Floor WC Toilet Pan / Bidet Fixing Bathroom Fitting Kit Inc Brackets. 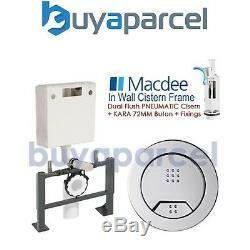 Macdee Pneu Compact Pneumatic Concealed WC Toilet Cistern Single Flush CPL41CP. Grohe 37762 SH0 Adagio Concealed 6 Litre Toilet Cistern - Side Inlet 37762SH. Geberit SIGMA01 Dual Flush Plate Gloss Chrome Sigma 01 - For UP320 Cisterns. Grohe 38526 Rapid SL 3 in 1 WC Set - 0.82m Concealed Frame Cistern Plate. SIGN UP TO OUR NEWSLETTER. Stay up to date with our special offers & promotions. The item "Macdee Toilet Frame + Dual Flush Pneumatic Cistern" is in sale since Tuesday, July 19, 2011. This item is in the category "Home, Furniture & DIY\Bath\Toilets & Bidets\Toilets". The seller is "buyaparcel-store" and is located in GB.